I hate to be the bearer of bad news, but, when it comes to cold emailing, the odds are stacked against you. The average person receives nearly 150 emails every day – and deletes almost half of them without even a second thought. Even worse, nearly three out of every four sales emails end up never being opened by their intended target. Now, this isn’t to say that cold emailing isn’t an effective sales strategy. In fact, the opposite is true: email is by far one of the most effective sales channels available (netting companies $44 for every $1 spent on campaigns) to incorporate as part of an effective marketing plan. Of course, to realize such an incredible ROI through cold emailing, you need to ensure your emails get noticed – and that the person on the other end actively engages with the message you’ve sent. You need to be persuasive. In this article, we’ll discuss five key strategies you can use to persuade your audience to not just open your emails, but also to engage further with your brand. Let’s take a look at some of the strategies and psychological “hacks” you can use to increase your chances of reaching these goals. The average time an individual spends reading a single email hovers around 11 seconds. What this means for you is, quite simply, you don’t have time to beat around the bush. Take too long to get to the heart of the matter, and your readers will almost assuredly move onto the next new message in their inbox. Again, though, this is assuming they even open your email in the first place. Let’s back up a bit and first talk about the importance of the subject line. According to data collected by Hubspot, 33% of email recipients decide whether or not to open an email based solely on the contents of the subject line. As a cold-emailer, this is good news. Essentially, this means that one-third of your recipients won’t care that they have no idea who you are – as long as your subject line catches their eye. In nine words, Jeff Bullas explains exactly what the reader will receive by opening and engaging with this email. What’s more, he also assures the reader that, whatever the offer is, it won’t cost them anything at all. Now, I expect to receive emails such as the one above (as I’m subscribed to Jeff’s mailing list). Because the subject line explains exactly what you have to offer, your intended target won’t have to spend much time or effort thinking about whether or not to open your email; if it’s even remotely of interest to them, they’ll surely check out what else you have to say. Which brings us to the body of your email – which should be equally as clear, concise, and direct. And when I say “clear, concise, and direct,” I mean it. The eleven seconds your reader will spend checking out your email is a mere fraction of the length of the typical elevator pitch. How will it help this specific individual (or company)? There’s no need to be clever or reinvent the wheel here. Simply tell your reader who you are and what you do within your company, describe the services you hope to provide your prospective customer and explain the benefits they should expect to reap through using said services. Though many of the strategies we’ll discuss later in this article have to do with adding something to your cold emails, the reason being direct and concise works so well is because you’re taking away the “fluff” included in most other emails. This allows your reader to quickly learn what you’re all about without having to spend an excessive amount of time wading through a verbose message. I’m going to go out on a limb and assume you know that starting a cold email with “Dear Sir” isn’t going to lead to many replies. As far as personalizing your emails goes, though, that’s pretty standard. Here, I want to get into what you really need to do to craft a personalized cold email. As we said in the previous section, your cold email shouldn’t just explain why your offer is valuable; it should explain why it’s valuable to the person you’re contacting. This is going to require some effort on your part – but it will totally be worth it when your clickthrough rate starts to skyrocket. You don’t necessarily need to know everything there is to know about your target reader; after all, the fact that you’re cold-emailing them in the first place means you’ve never actually met them, right? That said, you do want to give them the sense that you’ve carefully considered how you intend to provide value specifically to them (rather than simply trying to sell something regardless of whether or not they actually need it). Clearly, Nathan has done his homework on Bryan. Not only has Nathan actually visited his potential customer’s website, but he’s also noticed that his product (ConvertKit) would likely be of major value to Bryan, as well. For one thing, the modern consumer not only appreciates but expects to receive personalized service throughout their relationship with a brand. By touching on their personal needs right from the onset of your relationship, you make it clear that your company provides more than generic, baseline service to your customers. Additionally, a personalized approach to cold emailing showcases your empathetic nature toward your potential customers – even before you’ve actually interacted with them. As the saying goes, “we aren’t thinking machines that feel; we’re feeling machines that think.” In other words, your prospective customers first want to know that you truly care about them; after you’ve proven this, they’ll be much more likely to listen to everything else you have to say. While being personal and personable in your cold emails will buy you some time with your potential client, that alone won’t be enough to actually make a sale. Once you’ve hooked your target on an emotional level, you need to also appeal to their sense of logic, as well. In other words, you need to prove that whatever you’re offering is actually as valuable as you say it is. The best way to do so is by focusing on past results (both your company’s and your customers’). Clearly, the woman knows what she’s doing, as evidenced by her absolutely astounding income report. Anyone looking to ramp up their earnings as a freelance writer would be crazy not to listen to what she has to say. Obviously, your target clients will be rather skeptical of any claims you make about the value of your services – that is, unless you can back your claims up with evidence, such as in the examples above. If you can prove to them that your company is the real deal, they’ll be much more likely to respond positively to your cold email. Another way to prove your worth is by presenting the testimony of one of your current customers. Here, marketing consultant Jake Jorgovan took the liberty of attaching a case study to a cold email template to add some social proof to the claims he made about his services. In doing so, the claims he makes in his cold email come off more truthful than they do boastful. If you’re going to tell a complete stranger something awesome about your company, make sure you can backup your statements with either cold, hard facts, or the words of a third party. So far, we’ve focused mainly on explaining to our cold email targets what they have to gain by using our services. Now, we’re going to flip this sentiment on its head, focusing instead on what they stand to lose by not using our services. “Loss aversion” refers to the idea that people hate losing much more than they love winning. In recent years, the more colloquial term “FOMO,” or “fear of missing out,” has been used to further this sentiment, showing that we’re generally prone to take action not in the interest of gaining something, but in the interest of not not experiencing something. Although Neville chose to take a “before and after” approach, he may also have opted to illustrate an “alternate reality” scenario, in which the wine company never contacts Medhora, continues making $455 sales per email, and loses an astounding $494,500 per every 100 emails it sends out. Yes, if Neville were to say “See? They made $494,500 more than they would have had they not contacted me!” it would essentially mean the same thing as our above hypothetical scenario. But the psychological effect of considering the possibility of losing out on such potential gains weighs much heavier on the mind than the prospect of making such potential gains. Again, both of these statements mean the exact same thing. But the first statement focuses on what you stand to gain by using the service – as if using the service will provide something extra. The second statement, on the other hand, makes it clear that you’re actually missing out on where you should be – and every moment you aren’t using the service is time spent not reaching your highest potential. By injecting a sense of urgency into your cold emails, you make your target more likely to engage with you as soon as they possibly can. “Ultimately, your email recipients want the outcomes you’re presenting to them, whether it be avoiding pain or experiencing pleasure. But they might not think it’s the right time to engage with you. Write your email in a way that gets your recipient to consider re-shifting their priorities. 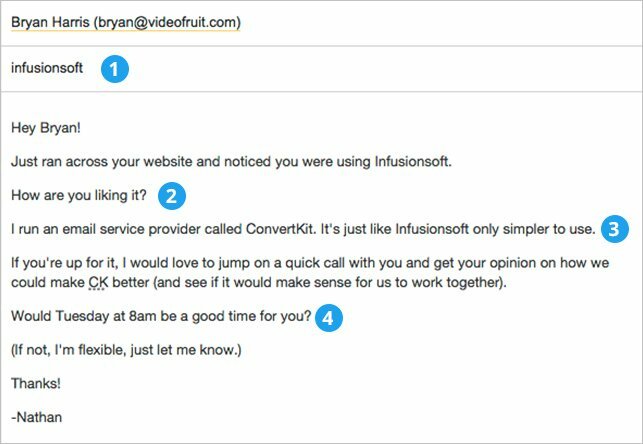 A “yes” email is the ultimate metric of success to your cold email campaign…but a “no” email can also help you refine your target audience or rethink your value proposition. I’m going to assume you have a decent amount of content available to the public on your website or blog, right? It invokes the rule of reciprocity. Essentially, the rule of reciprocity states that we’re more prone to do something that is asked of us if the person making the request has done something for us in the past. Perhaps you’ve decided to make an ebook that a specific target would find valuable. Or you’re putting on a webinar in the next month or so, and would like to invite them to attend. Or, maybe you came across a podcast by a giant in your industry, and simply want to point your target toward their website. Whatever the case may be, providing such valuable content free of charge will not only strengthen the notion that you truly care about your potential customer, but will also make them more likely to – at the very least – respond to your email. First, don’t tie in the “favor” you’re providing with your service offering. For example, you wouldn’t want to include a coupon for discounted service, as this is a rather transparent ploy that your target will most likely see right through. Your best course of action is to provide something that can be used completely independently of the service you provide. Secondly, don’t deliver the favor with strings attached. In other words, don’t send your target something simply so you can hold it over their head and get them to engage with you further. The rule of reciprocity works when people return favors on their own volition – not when they feel like they’re forced to do so. You’ve put a ton of work into crafting a cold email that will hopefully persuade your target to engage with you further. Now, you want to be sure they know exactly what to do in response to your email. Make your CTA clear, simple, and to the point – leaving zero doubt in your target’s mind about what to do next. The entire point of reaching out to a new target is to persuade them that they’ll find your services incredibly valuable. If you can get a perfect stranger to do all this, you have a pretty good chance of gaining them as a paying customer. Josh is the Content & Community Manager at Fieldboom, which provides an all-in-one lead capture and customer feedback solution to help with growing your business faster.